Since my initial attempt using New-WebServiceProxy failed because it didn't like the XML return from IPControl, I needed to find out why. This is where I downloaded SOAPUI to dig in and find out why. More importantly, I found that I could use the info from it to plug into the Invoke-WebRequest cmdlet. In the left pane of the SOAPUI window, you'll find services (I guess that's what you would call them) available for you to call. Under these should be 'methods' you can call. It was also @ this point that I noticed the interface property differences between Dell and BT Diamond. I 'think' this is why the new-webserviceproxy cmdlet had problems, but don't have any other web services to test against to know for sure. Right-click one and select "New Request" and give it whatever name you want. Now in the right pane, you should be presented w/ the XML formatted request that we can now use to pass w/ the Invoke-WebRequest cmdlet in powershell. Simply copy the XML and we're going to use it in powershell now. IP Control is actually simpler since all I need to do for the GetDeviceByHostname method is provide the hostname as a string (which powershell does by default), the xml request only has one question mark in that case. 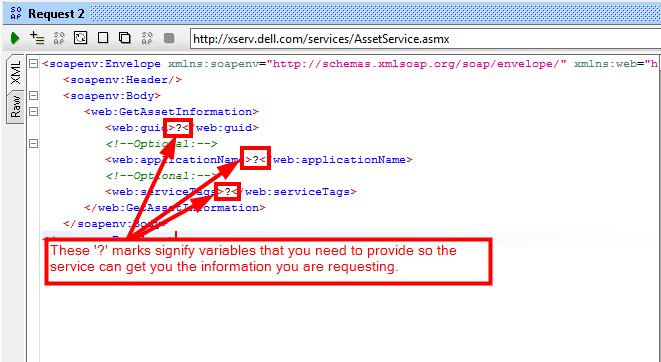 But below is the code you could use to request asset info from Dell. Again basic concept still applies. # This is essentially showing how you can pass credentials to a web service that requires a login. # I honestly don't know how to easily 'know' this beyond looking the wsdl page and looking for it. # GUID seems to be needed, I'm not sure why, but this is how you can make one fairly easily. # This is the important one, you need to change this to something you are essentially looking for. 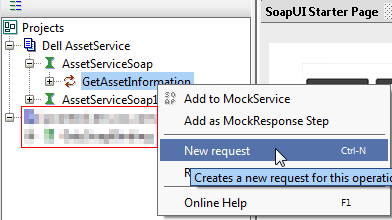 This the XML request that I copied from SOAPUI. If Dell's SOAP service required credentials, this is what the invoke-webrequest would look like. BT Diamond's IPControl also requires the SOAPAction header. Dell does not and will actually produce an error if it is included. # With all the information above, I'm now sending the request to Dell and saving the results in the $Results variable. This would be the path that contains the warranty 'objects' associated w/ the service tag you searched for. Well hope this helps someone. It's certainly been enlightening for me.